It's a simple day and it calls for a simple recipe. 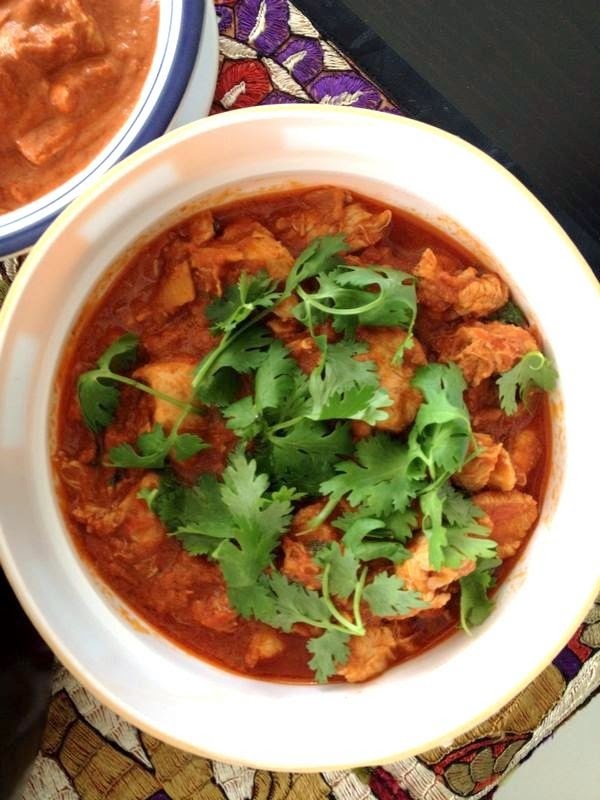 This Ginger Chicken, Pakistani style is probably one of the easiest recipes I know. All it requires is the standard Pakistani cooking arsenal of onions, tomatoes & masalas stirred & cooked together. But what creates the delicious medley of flavors in the dish is the finely julienned ginger added right at the end with a heaping handful of fresh fragrant coriander. 1/2 kg chicken, divided into 8 pieces. Alternatively, you can also use boneless chicken, cut into 2 inch pieces. 1. Heat oil in large pan on medium high heat. 2. Once oil is hot, add freshly grated ginger/ginger paste and garlic paste and saute for 1 minute till the flavor comes out. 3. Add onions and saute till light golden (about 5-7 minutes). Keep stirring so that the onions don't burn. 4. Add chopped tomatoes along with the rest of masalas (turmeric, coriander powder, salt & chilli powder). Keep stirring till the tomatoes thicken and becomes a jam-like consistency. 5. Add the chicken along with 1/2 cup to 1 cup water and let it cook on high heat for 2-3 minutes then turn it on low-medium till chicken is tender. It will take approx. 15-20 minutes for boneless chicken, whereas chicken with bone will take about 30-40 minutes. Once the chicken is ready, you should see the masala oil on top of the tomato gravy. 6. Approximately 5 minutes before the chicken is done, add tomato ketchup/tomato puree. 7. Add about 90% of the julienned ginger on top of the dish, and let it cook for a minute then take it off heat. 8. Garnish with fresh coriander and the remaining sliced ginger. 9. Serve with naan/chapati or fresh steamed basmati rice.